No matter who you compare him with, Tim Bowness is one of the most distinct vocalists of the past three decades. Besides his main output with No-Man, a band created with Steven Wilson (Porcupine Tree mastermind/solo artist, ex-Blackfield, Storm Corrosion, etc.) and lately Henry Fool, he collaborated with a myriad of artists on several records along the years. At first, he was reluctant to launch a solo career, but finally assembled the first LP, My Hotel Year exactly 10 years ago. It was a bittersweet, sometimes sparse experience that captured very well the essence of his gorgeous voice yet felt less memorable than other projects he's been involved in. After a long decade, the time was right for the follow-up, Abandoned Dancehall Dreams. What was originally the foundation of a new No-Man album (sigh), recorded with a live band, soon became the starting point for Bowness' very own full length. Since Wilson was too busy to add his input any time soon, Tim took advantage and continued with the sessions. This was a great idea as the result is a lovely and rewarding listen. Whereas it doesn't differ very much from their usual collaboration, the tunes are more engaging, while boasting the same misty atmosphere. Also, the very interesting lyrics, like always, portray various stories of several characters that are actually losers in life. Whether there's someone who will always be overshadowed by another ('The Warm-Up Man Forever'), an aging person who reflects upon her life ('Smiler At 50' & 'Smiler At 52'), others missing opportunities ('Dancing For You') or growing apart throughout the years ('Songs Of Distant Summers'), each of these descriptions are exceptionally brought to life with the help of his magnificent, emotional voice. Even though the two aforementioned tracks are clearly centerpieces, the shorter cuts share their lovely moments too. The eerie 'Waterfoot' brings back to memory the shiny early days of No-Man, with pastoral flutes, gentle acoustic guitar and warm bass lines, recorded again by Keeling & topped by Tim's heavenly delivery. Both are joined by Steven on 'Dancing For You', who adds the soft drum machine, creating another amazing tune. Reminiscent of mid-90s Porcupine Tree, the song shares some flashy solos and deep bass grooves that provide the perfect foundation for the vocals. Again there are such beautiful moments created with common chords and progressions. At the same time, 'Songs Of Distant Summers' benefits from even more minimal approach, consisting of etherial piano and synth pads that carry Bowness' voice like a lullaby. It could have been included on Together We're Stranger, No-Man's most introspective album yet. The thing is, you never know when it actually gets personal, because the lyrics are many times first person narrations that may or may not be related to Tim. The passion he sings with makes them all so intense and honest, you can live what the character goes through. In the end, I can't say if this would've turned out better or worse as a No-Man album. It's an interesting debate that in essence proves just how important this man has always been to the group, even if Wilson is more renowned overall. It took many years for him to have the strength to develop his solo career and now it finally paid off. As a visionary, he conducted the sessions really well, designing Abandoned Dancehall Dreams without any compromise. Moreover, the brilliant supergroup assigned to contribute have added their own touches even though they have been filtered through Tim's ears. The tender voice and the touching lyrics provide the rough core of the album, while the music helps shape everything much like a soundtrack to these short stories sketched by Bowness. There are a lot of layers to unfold with each listen and it will surely be an album that will stick onto a lot of people's playlists once they have gotten to the heart of it. Amazing record, I love it! Unfortunately there's no Soundcloud/Bandcamp track to share. Nice review. Learned about him just yesterday and I'm very keen on listening to his music. Thanks. He's amazing, check out the No-Man records, you'll be blown away lol. They are awesome! I have to do that some-when. I want to check out all of SW's music but I don't want think that Tim Bowness is overshadowed by SW. I believe - by what I read - that he is a very notable musician. 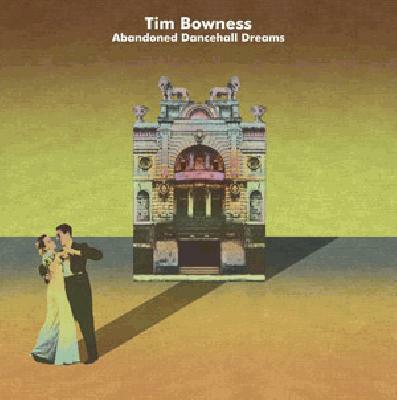 No matter who you compare him with, Tim Bowness is one of the most distinct vocalist of the past three decades. Nice, I need to get my hands on this. Great write-up. Heard anything 'bout new No-Man? Sweet review, Raul. This sounds interesting. I really like some of No-Man's stuff, so this sounds really interesting. "Finally, Bowness helms his very own ship"
Geddit surfaces + "very own ship"
"Tim Bowness is one of the most distinct vocalist of the past three decades"
Tbh, from one song I checked, nothing too distinctive came out. Still digging tho. Thanks Irving, I missed that! Well, it's a beautiful record and is one of the best things Tim has done so far. Happy to see him do this on his own. @SmersH - This was supposed to be the new No-Man record, so now who knows when the two will meet to record new songs... I wish Steven would leave aside his solo career for a year or two and do a No-Man record and a Porcupine Tree one. Both are long overdue! @Mythodea - I always saw him a bit overshadowed by Wilson, but lately he's involved in a lot of projects that brought him more recognition. The album is very good, but still not a 4.5 for me. Maybe it will grow on me, becouse it is a bit surprising comparing to previous Tim/no-man releases.